Poor office morale is bad for everyone. The business itself suffers from the loss of productivity, managers have to deal with high turnover rates, and employees are just plain unhappy. Research has shown the strong link between job satisfaction and work performance. Unhappy and disengaged workers don’t put in their full effort, and they are likely looking for other jobs. With a little push in the right direction, employees will recognize that healthy, positive habits are encouraged in the workplace and be inspired to follow suit. After all, a healthier workforce is a happier workforce! It shouldn’t be about the amount of hours employees worked. It should be about the quality of their work. Realize the difference between overworked employees and productive employees. If your work environment praises early mornings, late nights, and working on the weekends – you’re setting your staff up for disaster. An employee who doesn’t work overtime hours might be performing better than a member of the team who skips their lunch break regularly. An employer who doesn’t pressure long hours and praises work ethic instead will likely lead to positive staff morale. Employees will feel that their time and efforts are sincerely appreciated. Taking a short break (even five minutes every hour) will increase productivity and energy. If you notice that your employees hardly ever take a break from their desk, start encouraging them to do so. Some employees might not take breaks throughout the workday because they aren’t sure if it’s allowed or think it’s looked down on. Let employees know your stance on breaks. Lead by example and take small breaks throughout the day so that employees know they shouldn’t be afraid to go for a quick afternoon walk around the parking lot. A team that plays together will stay together! Work doesn’t always have to be a bore. Keep the workplace lively by adding some fun. Host healthy potlucks one a month, celebrate with a company happy hour after a big sale, or eat lunch together as a team every Friday. Make an effort to take employees on a fun excursion from the office at least once a year. A day of bowling or a trip to the zoo can help encourage social interaction and bonding among colleagues. Employees need to feel valued and respected on a personal level to feel happy and fully committed to their job. Start with something simple like celebrating employee birthdays and work anniversaries. These celebrations don’t have to be extravagant parties, but find a way to recognize special moments. Make an effort to ask employees how their day is going and how their family is doing. There are many easy ways to show employees you care about them both personally and professionally. This is the easiest of them all! Stay receptive and open-minded to employee feedback. For example, if you notice multiple employees think that your regular morning meetings are a waste of time, maybe it’s time to rethink those daily mandatory meetings and opt out for a less distracting way to share company updates. Try your best not to get defensive by any criticism or feedback. Employees should always feel like they can share their thoughts and ideas. If you’ve noticed a negative change in the moods of your employees, use these tips to help restore workplace happiness. When employee morale takes a nosedive, productivity and work performance are sure to follow. Keeping employees happy and positive will help reduce turnover and transform your office into an enjoyable environment for everyone. 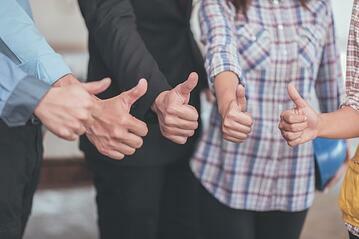 What tips do you have for improving employee morale? Share some ideas in the comment section below!